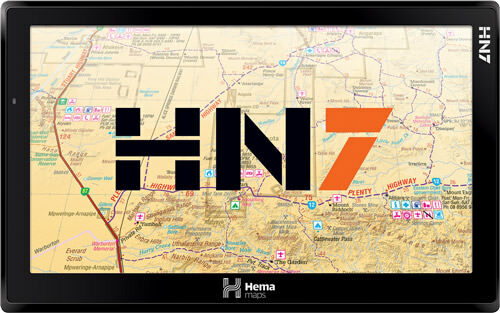 If you take a look at the HEMA website, then you’ll find that HEMA say that the HN7 is Australia’s most powerful touring machine. I thought it’d be a good idea to find out what all the fuss is about. 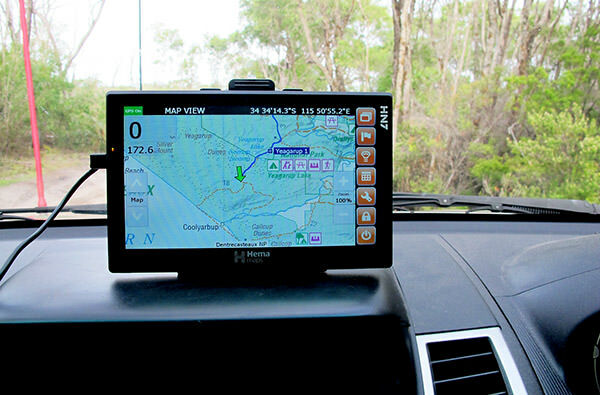 Luckily for me the Chart & Map Shop were kind enough to provide a brand new HN7 for me to play with for a weekend away down in WA’s south west. It’s always fun when a new toy arrives. And I was soooo looking forward to this one. I love playing with stuff. Stuff is fun. I’ve previously played with HEMA’s HN6 and also for the no-longer-available Mud Maps M7 so I was looking forward to seeing how the HN7 compared. And then it arrived. The box is quality. I mean really, it’s just a box right? But when the box is well thought out it does give you some kind of indication that the rest of the product will follow suit. The HN7 itself is an impressive bit of kit. It’s a 7” 800 x 480 pixel touch screen that has been designed to be touched with a finger. That’s right! Although you CAN use the stylus, you don’t NEED to! This is a huge improvement over the HN6 in my opinion. With both the HN6 and the M7, you could use your finger but it was not easy. You really needed to use the Stylus to get things done. That’s all changed with the HN7. It’s also interesting to note that HEMA say that there is no theoretical limit to the size (capacity) of MicroSD card that you can use. So in theory you can use one that’s as big as you like in terms of gigabytes. The largest capacity that HEMA have tested is 32GB. So there is plenty of room to upgrade if you need to. HEMA recommend that 16GB is probably the sweet spot so to speak, but that’s up to you I guess. The operating system that powers this little device is a version of Microsoft Windows called Windows CE6. CE6 was specifically designed for small mobile devices like this one and is the same OS that powered the HN6 and the M7. Around the outside of the HN7 there are a number of ports, plugs and buttons including a power button (OMG they’ve thought of everything! ), a MicroSD card slot, 2 USB ports (one for charging and transferring data and the other for accessing additional maps, photos, movies etc), a video input port for your reversing camera etc etc. These are all documented and explained in the user manual. Interestingly, with the HN7 there is nowhere to store the stylus. Probably because you don’t really need it given that the screen is designed for finger touch. The HN7 comes preloaded with OziExplorer and maps… So many MAPS! HEMA loves maps. The Chart and Map shop loves maps too. Maybe they should get together for a nice hot cup of tea. HEMA have a reputation for top quality maps and they give you plenty of them with the HN7. The software’s new finger-friendly interface is much easier to use than both the HN6 and the M7. Now that we’re all used to using our fingers with our smart phones etc. making the HN7 finger-friendly really was a logical evolutionary step for GPS devices. 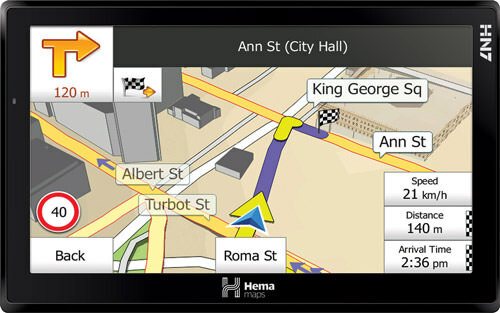 For city and main-road driving you’ve also got iGo Primo street navigation software making the HN7 a powerful and versatile navigation system for both on the black top and off the beaten track. But we know you want MORE!!! On top of OziExplorer, bajillions of Maps, iGo Primo AND stacks of Points of Interest, all loaded onto the HN7, HEMA have also included HN Explorer 2014. This is software that you install on your PC. You can use this to plan trips, map out waypoints etc. and upload it all to the HN7. You can also download your data from the HN7 and present it in HN Explorer! So after checking out all the bits and pieces, it was time to put it to a real life test. We were heading from Perth, down to Manjimup, Pemberton and the Yeagarup dunes and then on to the Yeagarup beach. 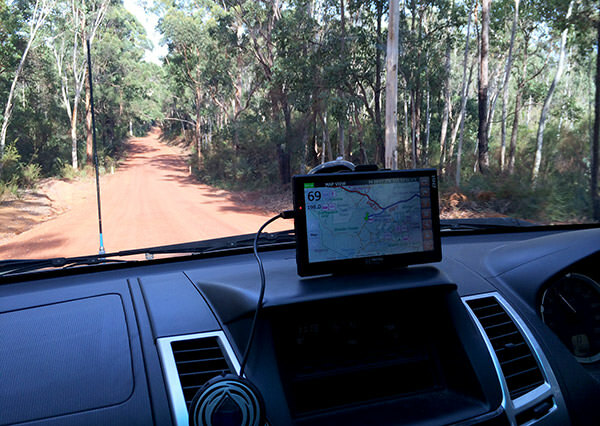 It was promising to be a great combination of on-road driving and off-road tracks. Heading out from Perth, I set the iGo Primo software with the address of our destination. The first thing I noticed is that it’s a very simple interface and very intuitive to use. And one of the best parts is that you’re not forced to type in the city, and then suburb, and then street. Instead you can enter a street name and browse for results in any suburb. Or of course enter a suburb and then start entering the street name. Such a handy feature if you’re not 100% sure of the name of the suburb you’re heading towards. As we drove down towards Manjimup, listening to the HN7 tell us to turn left in 300m onto whatever road, reminding us that the speed limit was whatever it was at the time, telling us that we were coming to a town entry point, I noticed that the screen display would change depending on what was coming up. For example, when we were on the freeway, it would zoom out and give us a high altitude overview of what was to come. But when there was some doubt about which road to take, it would zoom right in, or even change to a very close-up view of the road with a very clear indication of which lane we needed to be in. Also along the way, it would display pop-up markers highlighting points of interest such as free camping/stop over spots, fuel stations railway crossings. On occasion it did try to send us off on some very minor gravel roads, but there are a bunch of options you can select so that you stay on the major roads if that’s what you want. 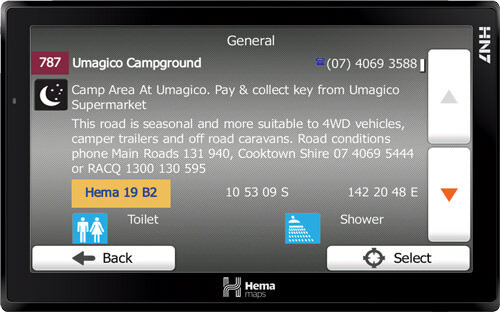 But the iGo Primo software is capable of much more than just telling you where to go and nagging you about speed limits. There are, of course, all the typical configuration settings that you can play with, but there is also a section where you can perform updates to the maps and software, attach (via Blue Tooth) and use a mobile phone, view pictures, convert units, calculate fuel consumption, etc etc etc. One of the most surprising features in here is the clothing conversion utility. You can quickly and easily get information on shoe sizes for men and women, dresses, shirts and even bra cup sizes! Such useful information! Apparently a European girl who tells you she’s a C cup is actually only a B cup in Australia! They haven’t been lying to you all along after all! Anyway, we eventually arrived in Manjimup and before going to bed I played with the HEMA HN Explorer software that you can install onto a Windows PC or Laptop. The software itself is quite simple to install but actually getting the HN7 to talk to the PC was a mission! All I can say is that it’s lucky I work in the IT industry and had some kind of idea about what I was doing. Once it was installed and attached, though, it’s remarkably simple to use. I was able to mark some waypoints that we’d navigate to along the way and load them up to the HN7. Very handy tool when it comes to planning a journey. The next day would take us further south towards Pemberton, and then onwards to Yeagarup Lake where our off-road adventure would begin. I loaded up EziOzi before we left. 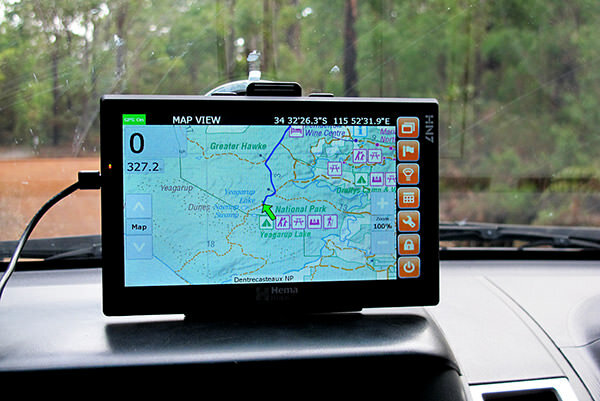 Although the iGo Primo is used for on-road navigation, there is no reason why you can’t use EziOzi instead. You just don’t get the turn by turn voice navigation and it’s now where near as detailed or helpful when it comes to towns and cities. 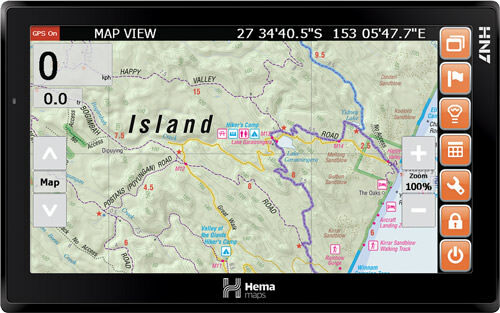 The first screen you’ll see is the GPS information screen. This loads up by default while it’s finding a few GPS satellites. Down the right hand side is a toolbar that allows you to navigate between the different screens. I won’t go into how to use the software. There is plenty of documentation to help you in that respect. Suffice to say that it is very intuitive, but you will need to spend some time playing before you rely on it. You don’t want to get stuck not knowing what you’re doing. But it’s not difficult. After only a short time I was able to very quickly add waypoints for interesting things we found along the way. And entering detailed information about each waypoint is very simple with the pop-up on-screen keyboard. It’s probably best not to do this while you’re trying to drive though. Wait until you’ve stopped or you might find yourself creating your own tracks! On our drive through the dunes I found that the track we were following was mapped almost exactly correctly. The only variation was a section where the track actually diverted from where it went previously so the inaccuracy was to be expected. On our way, we came across a hiker. He was a French guy who was travelling around Australia with just a backpack to carry his gear in. He said he had a very good sleeping bag and a tarpaulin to sleep under. He’d heard about the beach and wanted to see it for himself and spend a few nights camping near it. He was more than happy to jump in and get a lift to the beach. This did, however, mean that he didn’t really know how far back it was. Driving is much easier than hiking after all. Using the EziOzi software, once we were down on the beach, it was a very simple task to find out how far it was back to our starting waypoint at the Yeagarup Lake. Very intuitive and simple to use. And when it came to driving back, it’s simple to re-trace your route and follow it back. OziExplorer draws where you’ve been on the map so you can just follow yourself back to where you came from. Not really needed down at Yeagarup. The track is very, very well used so it’s difficult to get lost unless you really try hard. The HN7 is very simple to use and intuitive. There are only a couple of things that I think could improve, but these are only minor really. Firstly, as mentioned previously, connectivity to your computer is complex. You need to have the Windows Mobile Device Centre installed. Obtaining this varies depending on the version of Windows that you’re running and may not actually be available at all. You may need to download it separately from Microsoft. HEMA have documented the process well, but it’s still complex. Get your 10 yr old kid/grand kid to help. They’ll probably know how to do it. And secondly the battery life of the device is not great. Be very conscious of the battery because it really doesn’t last as long as you’d expect it to with all the mobile devices that are around these days. We’re just used to these things lasting for at least a full day. The HN7, when not plugged in, will probably last only a few hours at the most. Lastly, in OziExplorer scrolling the maps is not particularly smooth. 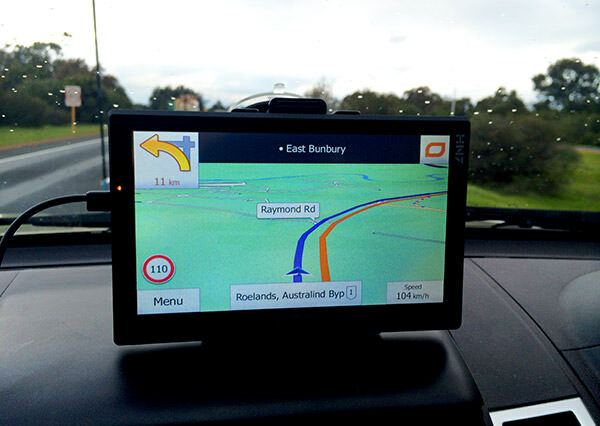 You have to turn off the GPS before you can swish the map around to see what’s not quite on the screen yet. And then when it comes to swishing the map around with your finger, it tends to jump around quite a bit meaning that it’s difficult to view the precise location that you may want to view. Having said this, the negative points I’ve mentioned are definitely not show-stoppers. As long as you’re aware of them then they’re not really a big deal. I’d rate the HN7 over the HN6 as you’d expect. It is an upgraded device, so that’s not a surprise. I’d also rate it higher than the Mud Maps M7 mainly because of the finger touch interface. And the unit feels a little more robust than the M7. But then the M7 was significantly cheaper. But it’s not available anymore so you can’t have it! Once again I’d like to thank the Chart & Map Shop for giving me the opportunity to play with the HN7 and can I please keep it pleasepleasepleasepleaseplease! If you want to buy one of these wonderful machines, check them out here and you also get a free sun visor worth $35.